On a warm June day, with the sun just peeking over the horizon, Dr. William Armon waits outside a wolf enclosure at theEndangered Wolf Center in Eureka, Missouri. He watches as keepers calmly and quickly corral an adult male and female wolf, Mack and Vera, separating the parents so the veterinarian can perform 6-week health checks on their two young pups. 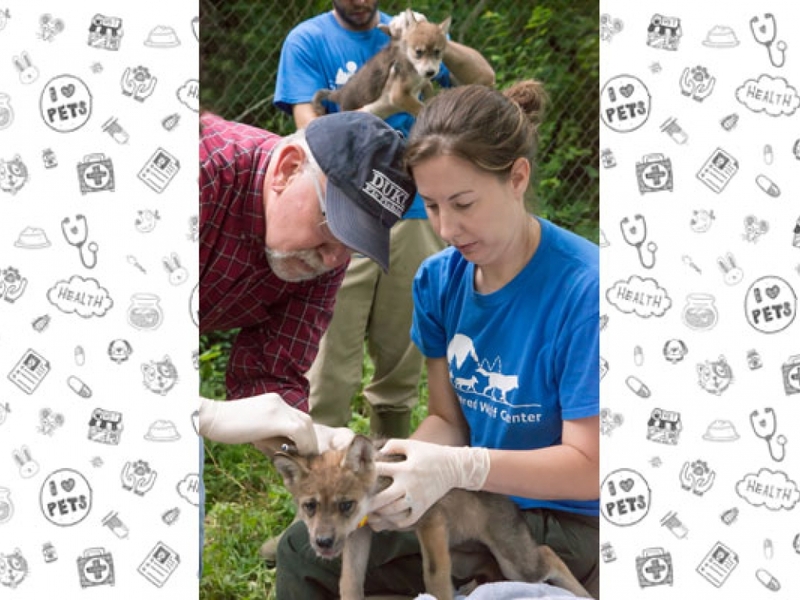 These tiny Mexican gray wolves were born on May 2 at the center, and this will be the first time they’ve been physically examined. The goal is to release the young wolves into the wild, so the staff spends as little time as possible in the enclosures to avoid having the wolves get used to humans. The enclosures have cameras, however, which allow the staff to keep an eye on the wolves during the day. “Wolves are not the snarling, angry animals that many people think they are. They are naturally afraid of people." 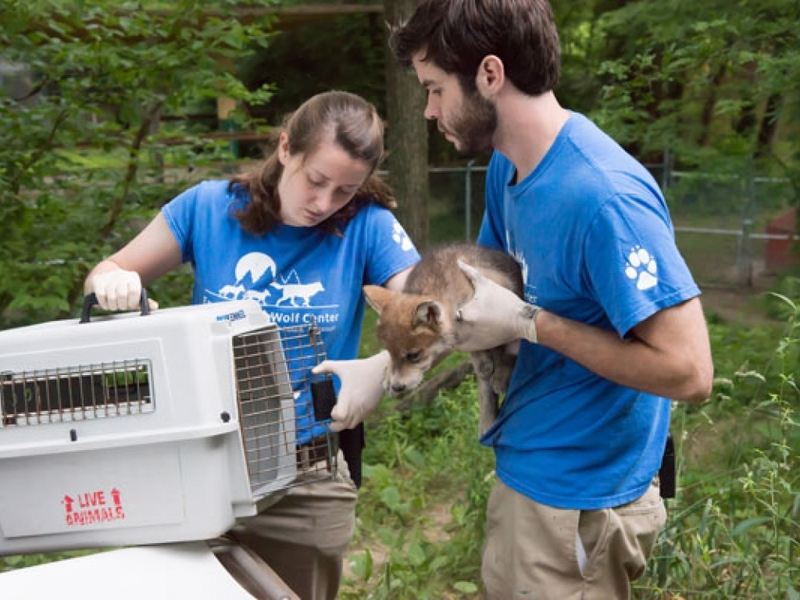 Any time the veterinarian or staff need to enter one of the wolf enclosures for a health check, they try to minimize the stress for the animals. The wolves that aren’t being checked tend to get nervous and pace, which puts them at risk for overheating. That’s why, during the warmer months, the staff go in close to daybreak, to work in temperatures that are cooler. In the wintertime, they have a little more flexibility, so they usually start the health checks later (around 10:00 or 11:00 am), to avoid working in freezing temperatures. When the staff members and Dr. Armon enter the enclosure, they perform their duties efficiently so they can get in and out fast. Dr. Armon has about 5 minutes per animal to make sure each pup is healthy and to deworm, vaccinate, and give a heartworm preventive. Regina says the stress for the pups is similar to what you might have experienced when you went to the doctor for the first time. This season, the veterinarian has already done health checks on a litter of four pups that was born a bit earlier in the year to parents Sibi and Lazarus. After these initial checks, he’ll follow up with both litters when they’re about 10 weeks old. 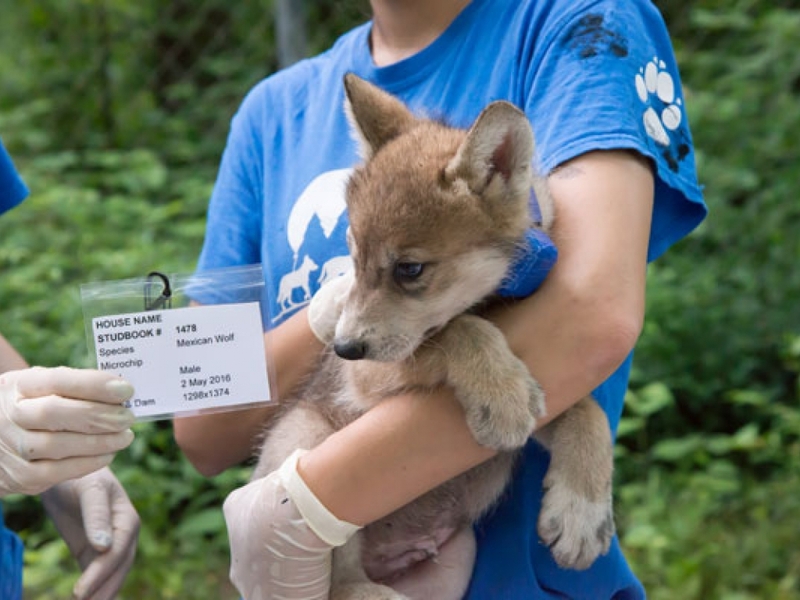 So What Exactly Does the Veterinarian Do During a Wolf Pup Health Check? Dr. Armon does a quick physical examination from head to tail. He makes sure the pup is healthy overall by checking the eyes and ears, teeth, and muscle tone. He weighs the pup, takes its temperature, and checks circulation (he uses a stethoscope to listen for abnormalities, like a heart murmur). 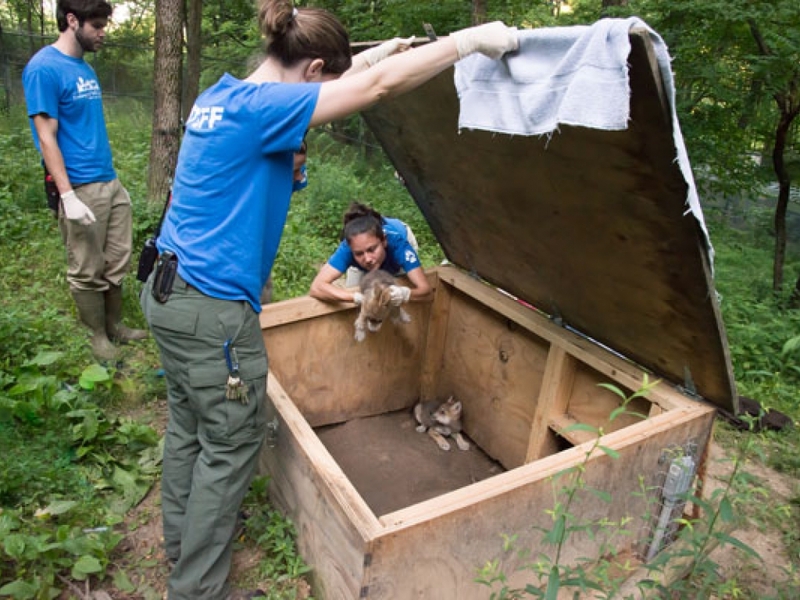 The center only releases healthy pups into the wild, so this step is crucial in determining whether the pup will be ready to be released once it’s old enough. The veterinarian also examines the pup for fleas and ticks, which can cause diseases that may be life-threatening, especially in young animals. Typically, he finds a few ticks on the pups, but so far this year, he’s only found a single tick on one pup. 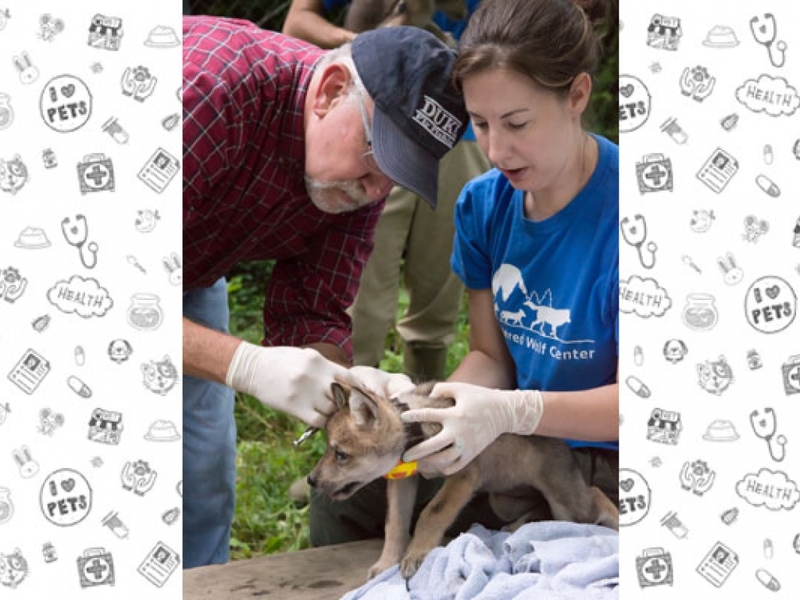 Dr. Armon then vaccinates the pup against the same potentially deadly diseases that dogs typically receive vaccinations for: distemper, adenovirus, parvovirus, and parainfluenza. 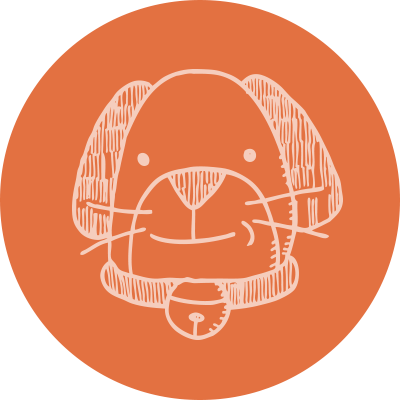 When the pup is a bit older, he’ll also vaccinate it against leptospirosis and rabies. In addition, he gives the pup a heartworm preventive, to protect the young wolf against heartworms (which are transmitted by mosquitoes) and a dewormer, to eliminate any intestinal (internal) parasites, including roundworms, hookworms, and whipworms. Dr. Armon inserts a microchip and immediately checks it to make sure it’s working and can be found with a microchip scanner. This time around, Dr. Armon also outfits each pup with a special collar that will expand as the young wolf gets bigger. The Endangered Wolf Center is working with the U.S. Fish and Wildlife Service to test these collars, which contain radio transmitters. Once the pups are released into the wild, these collars will help the organizations track the young animals, but only if the collars work. On one of the previous attempts, the pups chewed off the long antenna. This updated version has an antenna inside the collar. Does the Veterinarian Wear Anything Special When He Works With the Wolves? Dr. Armon doesn’t wear any specific outfit, but he says, “I’ve found that if I wear something with a lot of pockets, it’s useful for holding everything I need.” He also wears a long-sleeved shirt, long pants, and taller boots to help keep mosquitoes and ticks off him. 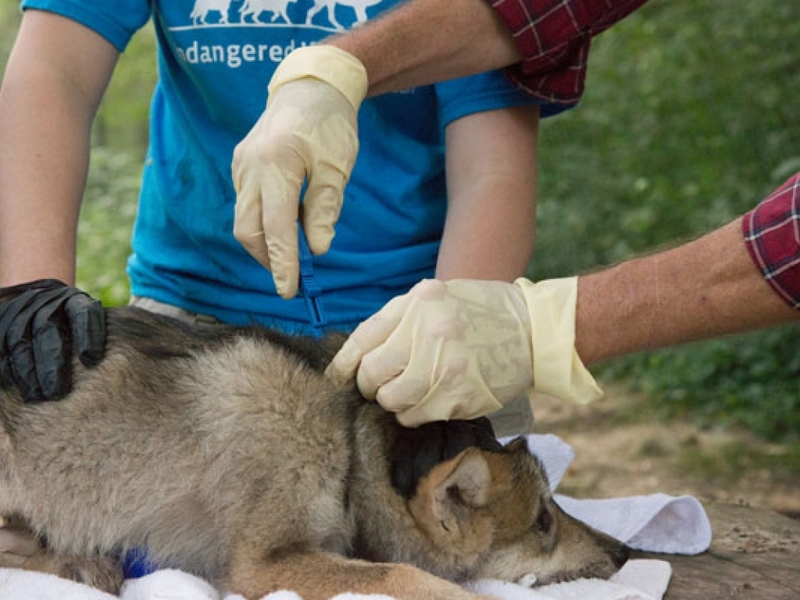 He and the wolf center staff typically check themselves for ticks afterward. Who Helps the Veterinarian During the Health Checks? Besides the Young Pups’ Health Checks, What Other Work Does the Veterinarian Do With Wolves? 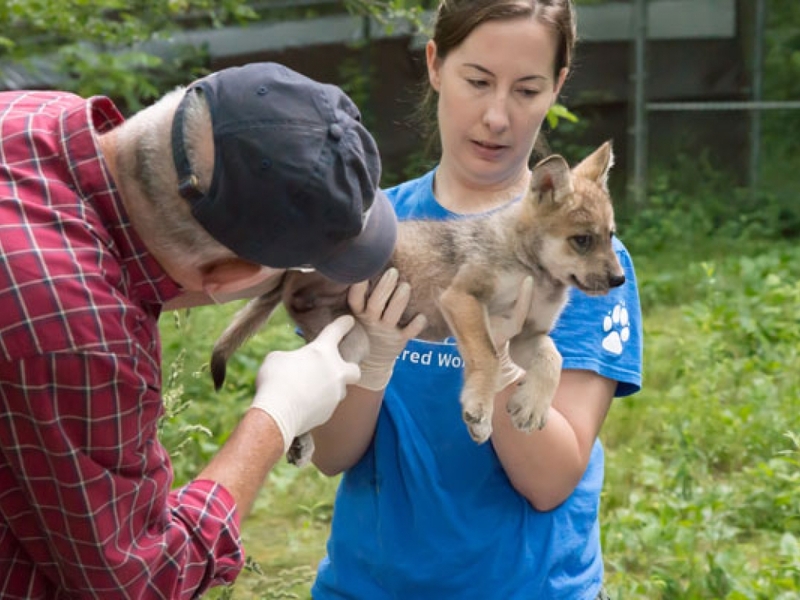 The Endangered Wolf Center is located near the Saint Louis Zoo, so if a wolf suffers severe trauma or needs to be hospitalized, the wolves are transported there. But Dr. Armon takes care of more minor issues, such as treating cuts or abrasions, along with giving annual vaccinations and heartworm tests, as well as taking stool samples to check for internal worms and Giardia infection (the same as he would check for in dogs). Do You Want to Work With Wolves? Wolves have always fascinated Dr. Armon, which may explain why he has a long history of working with them, even before he became a veterinarian. When he was in college, some friends he had met at a dog show traveled around the country with wolves they had hand raised. They educated people about wolves and needed help caring for the animals they traveled with, so he took a break from college and helped out. Dr. Armon says that nothing compares to hands-on experience. Volunteering at a wolf sanctuary like the Endangered Wolf Center is a wonderful way to start being around the animals. That’s how Dr. Armon started working with the wolves at the center. 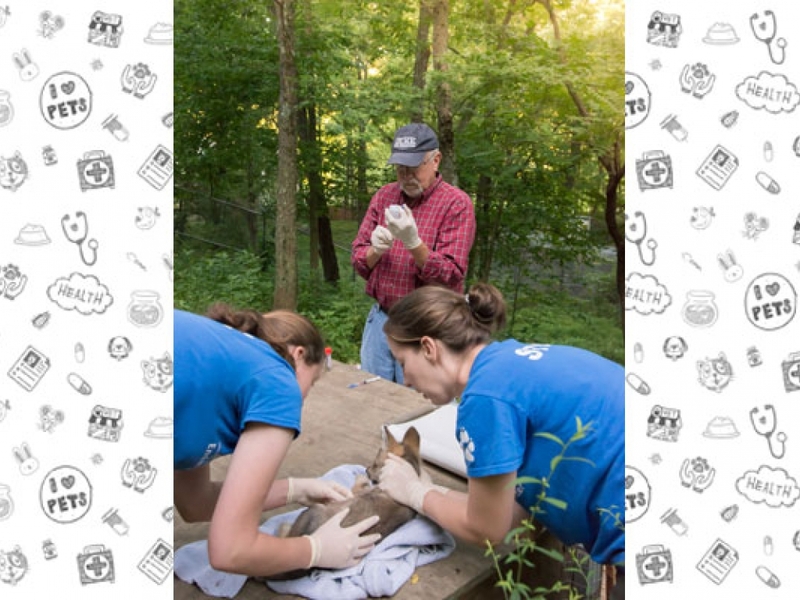 After helping out his friends with their wolves, he finished getting his veterinary degree, then returned to the St. Louis area and offered his expertise as a part-time volunteer to the founders of the Endangered Wolf Center. He eventually became the center’s primary contract veterinarian in 1994. 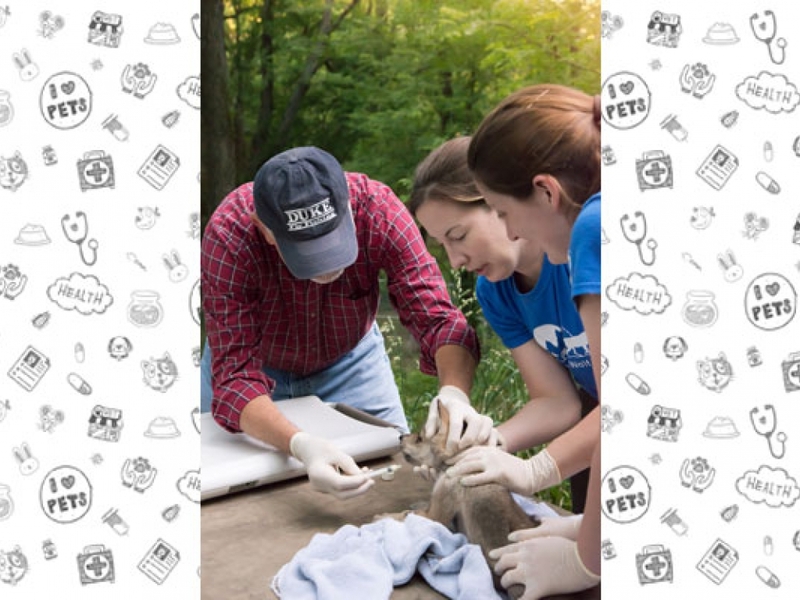 Junior volunteers can start working at the center at 14 years of age, and future veterinarians who are 18 years and older can apply to intern. For those who aren’t yet old enough to volunteer or intern, visiting a wolf sanctuary is a solid step toward your dream. Many of these centers welcome visitors, and some have special tours, overnight camping programs, and even wolf camps! The camps in particular can help you explore the world of wolves and learn all about their behavior. The Endangered Wolf Center officially opened in 1971. 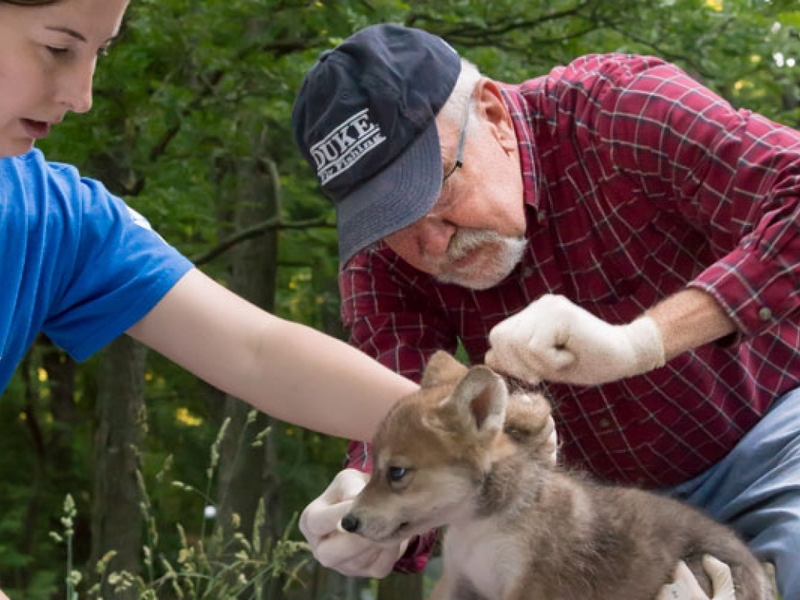 Located just outside of St. Louis, Missouri, the nonprofit was the first center of its kind and is considered the cornerstone of wolf conservation in the United States. 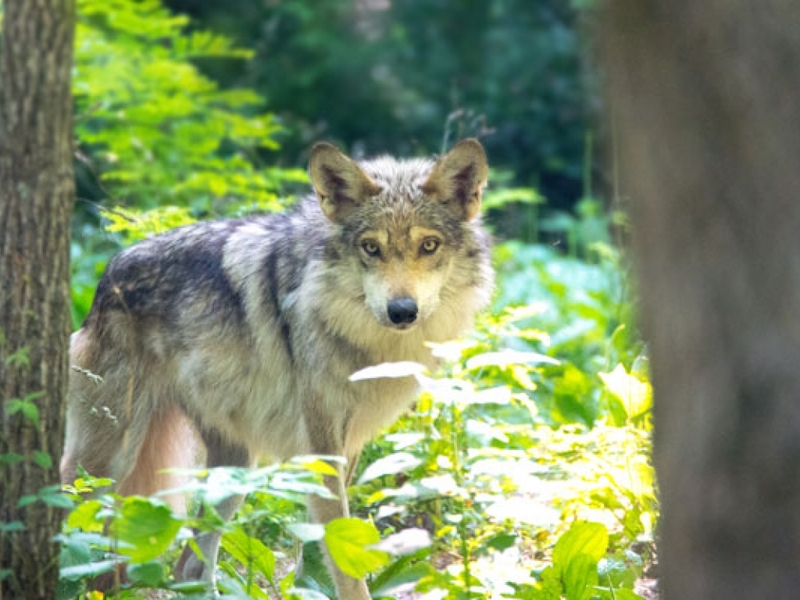 Its mission is to preserve and protect Mexican wolves, red wolves, and other wild canid species from extinction and release them back into their wild, natural habitat. Every Mexican gray wolf in the wild can be traced back to the center. wow it is so cool that you had one for a pet! did you find her when you where hiking? i love wolves they are amazing. These people are right wolf are misunderstood and are just scared of humans. I'm glad they saved these little guys. Seriously they might hurt other animals but that is just to eat not be mean. Thats why I totally agree with these guys I love this story. Wolves are wonderful animals. Yes, they are predators. Yes, they harm different animals. But they also give life to many more. For example, when wolves were reintroduced to Yellowstone, they caused a trophies cascade. That is when one animal changes the behavior of another, and that changes something else, and so on. In this case, the deer in Yellowstone had no predators to control them, and they ate all the vegetation, which caused herbivores to die off, which meant no first order consumers for the second order consumers to eat, which killed the second order consumers. But when wolves were reintroduced, they made the deer more wary, and the deer moved to different places, where they couldn't be easily hunted. This allowed vegetation to grow back in certain areas which meant food for rabbits and other animals. And when the rabbit population rose, there was more food for predators, so they came back. And scavenger animals came to feed on the remains of a kill that a predator left behind. The land was more stable as well, because the roots of the vegetation kept the soil in place, decreasing erosion. This meant less collapses of the land, which meant that the river took a more straightforward path, and was less likely to change course. And the vegetation that grew provided habitats for certain animals. Songbird populations rose as well. It's amazing how much change one species can cause. Sorry. I meant trophic cascade, not trophies. wolves are a very misunderstood species. perhaps if we learn about them instead of fearing them we would be able to come to a agreement between species for as the canine is harsh and strong it is also nurturing and loving.